In 1870, an audience watched as a stage was set with two buckets, one on top of the other. Due to a small hole in the upper bucket, water poured into the lower bucket, bending as it did so. To the audience’s amazement, sunlight followed the bend of water — a phenomenon later termed total internal reflection. The performer on stage, John Tyndall, was one of the many scientists who tried to control the most visible form of energy: light. For decades, researchers aimed to find a way to control light and use it for the transmission and processing of information, an area of study known as photonics. In the meantime, electrons took this responsibility on their shoulders. More recently, scientists were able to viably manufacture nanostructure devices and control the flow of light, due to the extensive development of technologies such as photolithography, molecular beam epitaxy, and chemical vapor deposition. The packets of light (photons) were projected as a prospective candidate to assume the responsibilities of sustaining Moore’s law. The goal of researchers studying photonics was to deliver an analogue of an electronic integrated chip that could perform all of the required computational processes using photons while being space and time efficient. Scientists termed this technology photonic integrated circuit (PIC), devices that could integrate different optical components on a single substrate. This chip should, in principle, be able to perform various optical operations, such as focusing, splitting, isolation, polarization, coupling, modulation, and (eventually) detecting light. Schematic of the photonic integrated circuit (not to scale), showcasing different optical components. For more information, see Ref. 1. In this blog post, which is the first in a new series on silicon photonics, we discuss optical waveguides. Later in the blog series, we will contemplate how these optical components came to be an inevitable part of PICs. The different optical components constituting a fully functioning PIC were subject to research. Scientists determined that the way to create the light source was through lasers, which could deliver a narrow-band light source to the integrated chip component. As for optical fibers, they could transport light from one end to the other for thousands of kilometers. Then there was the most common component in a PIC: the optical waveguide. This waveguide could link different components on the substrate. Input couplers were developed to efficiently couple the light from lasers or optical fibers to the optical waveguide placed on the substrate, while directional couplers were created to control the coupling of light between two parallel optical waveguides. Then came the ring resonator, which served the same purpose as an optical filter (that is, allowing only a narrow band of frequency) and could also couple two optical waveguides in opposite directions. An example of an optical ring resonator notch filter. Some scientists probed the much underappreciated nonlinear optical effects to devise second-harmonic and third-harmonic waves. With these waves, it would be possible to perform operations between two optical beams, such as frequency doubling, differencing, and mixing. Another invention was optical modulators. These components could modify the light intensity based on the applied DC bias potential using the nonlinear electro-optic effects. From nature, it was observed that with the periodic arrangement of high- and low-refractive-index materials in 1D, 2D, and 3D, it was possible to reflect a certain band of frequency while allowing another band of frequency to pass. Hence, these materials could act as both a filter and resonator in a certain periodic arrangement. The periodic arrangement of different dielectric materials was termed a photonic crystal. With the idea of creating optical waveguides to propagate light on chip-scale packages, scientists were left to wonder which materials to use. One of the materials was high-refractive-index GaAs. This was used as the core and was surrounded by low-refractive-index AlGaAs. More advanced techniques were developed to dope titanium in the lithium niobate substrate to increase its refractive index and form a core. The focus was narrowed down to silica, which is more easily available than any other material. The technology came to be known as silica on silicon (Si-SiO2) or silicon on insulator (SOI), where the silicon (high refractive index of ~3.5) was embedded within silica (lower refractive index of ~1.4). The fabrication techniques for silicon were well established (courtesy of electronic chips) and at the same time, silicon was compatible with other CMOS techniques, which helped boost research into silicon photonics technology. The crux of the silicon waveguide lies with the high contrast of the refractive index, around a 50% difference. Prior work relied on total internal reflection to confine the energy. In this case, energy was confined in a higher-refractive-index core that was surrounded by a low-refractive-index cladding. However, recent work confined the energy in the lower-refractive-index slot neighbored by the high-refractive-index slabs, inherently helping to lower losses. The first technique involved confining the energy in a higher-refractive-index medium, where the inner core (in the order of hundreds of nanometers) is devised with a high-refractive-index material (silicon) surrounded by a low-refractive-index cladding (silica). The difference in the refractive index must be as much as 50%. The fundamental mode is confined in the core, as shown in the image below on the left, and the confined normalized power, as shown in the image below on the right. 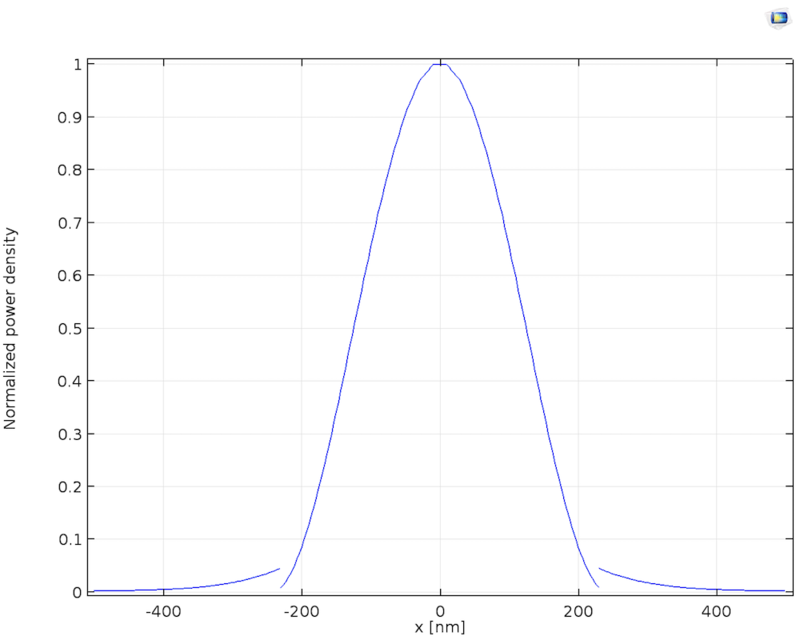 Left: The fundamental mode for an operating wavelength of 1.55 um. The white and black arrows depict the magnetic and electric field. Right: The normalized power density through the center of the waveguide. Although counterintuitive, the energy could also be trapped in a low refractive index. Moreover, it was found that more energy stays put in an even and narrow region (20 to 80 nm), which makes a low refractive index more compatible for integration with photonic circuits. Such a design involves two slabs of high refractive index neighboring a nanoslot of low refractive index. Further, considerable energy is bounded in the slot. Left: The transverse (Ex) field for a slot width of 50 nm. Right: The normalized transverse electric field (Ex) through the center of the waveguide. To analyze the required width of the nanoslot for delivering maximum power through the waveguide, it was imperative to perform a sweep of the width, as shown below. 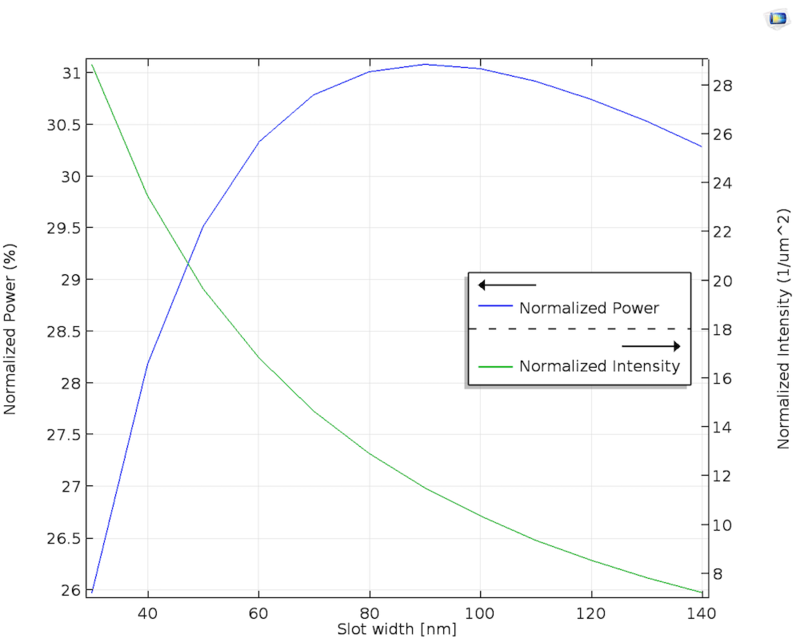 The normalized power and intensity in the slot versus slot width. Fabricating such an optical waveguide prototype and then analyzing it is resource intensive. An alternate, preferred approach is to use numerical tools such as the COMSOL Multiphysics® software. With this simulation tool, one could quickly set up prototypes and investigate further before finalizing the prototype to be fabricated. 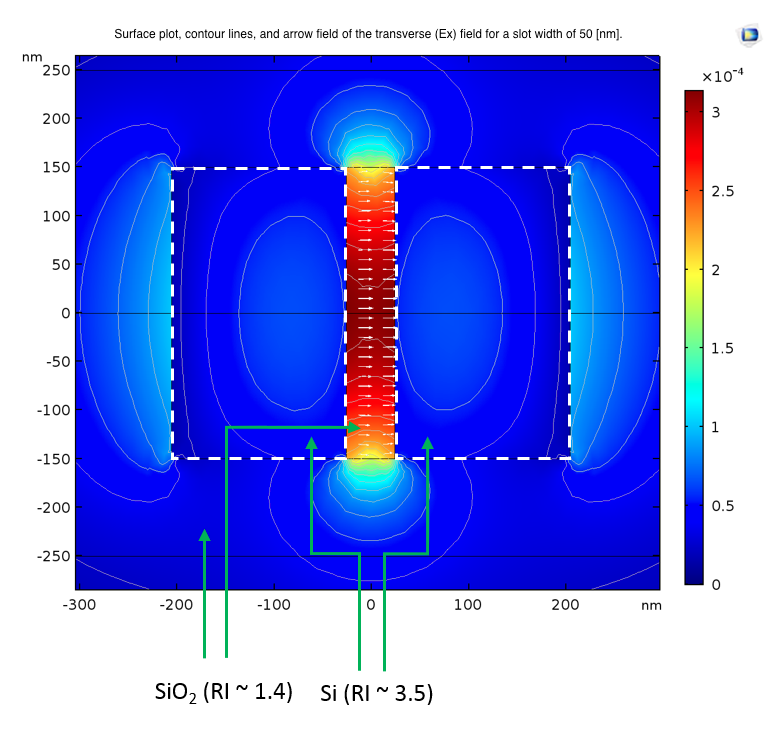 We can use COMSOL Multiphysics to perform a mode analysis on the 2D cross section of the silicon waveguide (both for high- and low-refractive-index cases). This enables us to evaluate the effective refractive index of the waveguide and the fundamental mode, which helps us understand the normalized power distribution. We implement the full 3D propagation for both types of waveguides by first having a 3D geometry of the optical waveguide and assigning Numeric Port boundary conditions on both ends of the waveguide. The Boundary Mode Analysis study (similar to a mode analysis in 2D) could be applied on these numeric ports to figure out their fundamental mode. The fundamental mode could be used to propagate within the waveguide using the Frequency Domain study, as shown in the animations below. The y-component of the H-field propagating in the high-refractive-index confinement case for a silicon waveguide with a length of 10 um. The y-component of the E-field propagating in the low-refractive-index confinement case for a silicon waveguide with a length of 10 um. 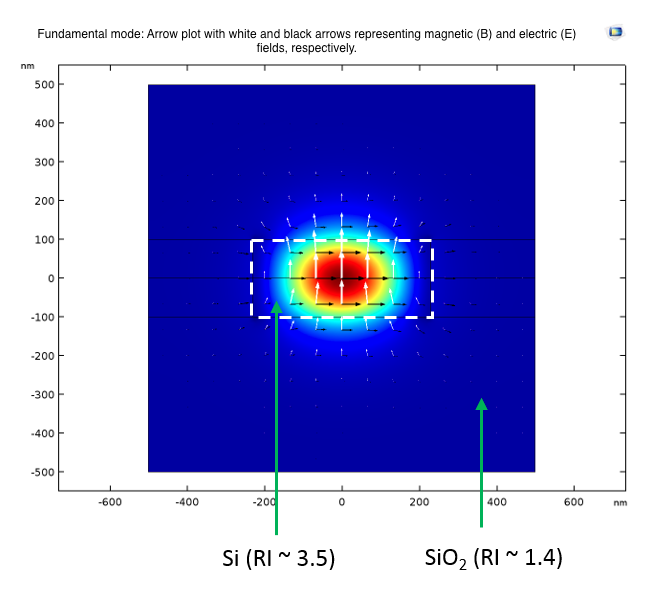 This is the first blog post in the Silicon Photonics blog series, where we will discuss different optical components in detail and how a finite element analysis tool such as COMSOL Multiphysics can help design these components. On our journey from laser cavities to photodetectors, we will meet some fascinating scientists and discuss how they attempted to control light. B.E.A. Saleh and M.C. Teich, Fundamentals of Photonics. K. Yamada, “Silicon Photonic Wire Waveguides: Fundamentals and Applications”, in Silicon Photonics II, 2011. V. Almeida, Q. Xu, C. Barrios, and M. Lipson, “Guiding and confining light in void nanostructure”, Optics Letters, vol. 29, pp. 1209–1211, 2004. I need help in designing the optical cable with a nanoparticle attached at its one end and study the effect of passing a laser through it. Is there any procedure to follow to accomplish this? Then I can attach the two models together. Can anyone guide me through the procedure to follow for it? 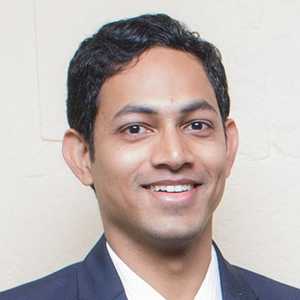 Hi Rishabh, I believe you initially you can start with a 2D approximation of your dielectric waveguide (https://www.comsol.com/model/14709) and then introduce the nanoparticle within this waveguide itself. To know how to launch the laser in 2D, you can go through this Beam splitter (https://www.comsol.com/model/31041). To extend this discussion, I believe support@comsol.com would be the best avenue. I wanted to know is there any possible way to draw a structure of astroid in 2-d and then extrude it to form a 3-d structure. Or is there any e=way to directly draw structure like that? For example- I want to draw a structure of a prism in which I can manipulate its edges to be curvy and at the same time it should have a tip (which should behave as a point) and from that tip and the structure of that polygon or pyramid or prism enhances with distance. We are not able to see/watch the video attached with this blog. Dear Subhash, we would recommend you to download or update Adobe flash player in your current PCT and then you should be able to see the video. We are able to see the video at our end. Hi. Could you please tell me how to set the animation of 3D silicon waveguide in Comsol, or could you please upload the demo of this simulation work? The 3D animation of the silicon waveguide is very much similar if you do the following steps in the Waveguide Adapter #140 model file. Step 1: Run the model for a single frequency (i.e in Frequency domain study). 2. Right click “Export >> Animation >> Player”. 3. Choose “Animation >> Subject >> Electric field”. 4. Choose “Animation >> Settings >> Sequence type >> Dynamic data extension”. This enables the phase dependent frames data. 2. Light and cladding overlap factor for say TE00 mode. The best place to pose the question regarding your model will be support@comsol.com. There we can give you in-depth response. I am trying to propagate light through 3D optical waveguide(like as “Designing and Prototyping Silicon Waveguides”) but I can’t done it.Light becomes splitted.Please help me. Hi Arif, now we have uploaded both the models in the “Try It Yourself” section in this blog. The second model showcase the approach to model 3D optical waveguides. Thank you for your response. Can you please provide the pdf containing the steps for doing the 3d optical WG simulation? We don’t have the step by step process for the 3D model. However the approach is exactly same as in “https://www.comsol.co.in/model/dielectric-slab-waveguide-14709” only the geometry is changed. In addition to my earlier comment, the major changes from the model #14709 is that the 3D model is using ewbe (Beam envelope) interface and a Physics controlled mapped mesh designed specifically for Beam envelope interface (available only in Wave optics module). I need your help to modelnig a silica high mesa waveguide in my comsol 5.3a. Please give me mph/pdf file for building a general model of high-mesa waveguide, if possible. I’m new in comsol. The best place to pose a specific question regarding your model will be support@comsol.com, where we can give you an in-depth response.